Built by Mughal Emperor Shah Jahan in the seventeenth century - Moti Masjid or the 'Pearl Mosque' is one of finest structures after Taj Mahal. It was originally constructed as a royal court and a private place of worship for the King’s royal members. Located inside the Agra Fort, it can found in the north of Diwan-e-Am complex. It has three main gates out of which the eastern Khizr or Water gate is the grandest entrance, intricately designed. Both the northern and southern gateways consist of ornamental iwans and are crowned by three square chhatris. 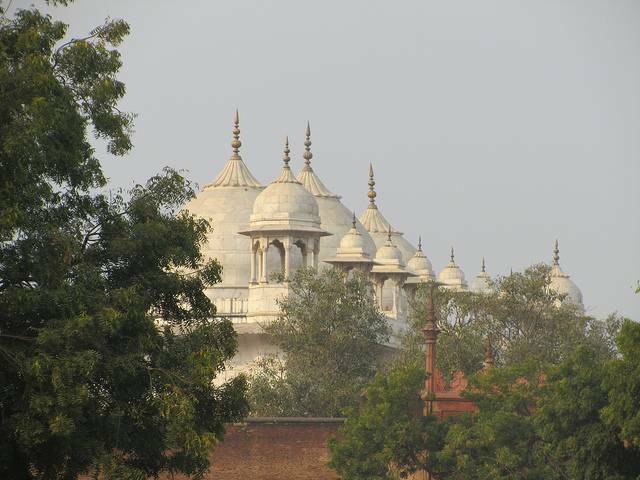 Its three Hindu style domed kiosks have been constructed purely of shiny white marble (thus, the name ‘Moti’) and the rest of the exterior building made out of red sandstone. It remains closed to visitors, but can be viewed from the outside.